AOC has once again partnered with a powerhouse in the global entertainment industry – Twentieth Century Fox Film. 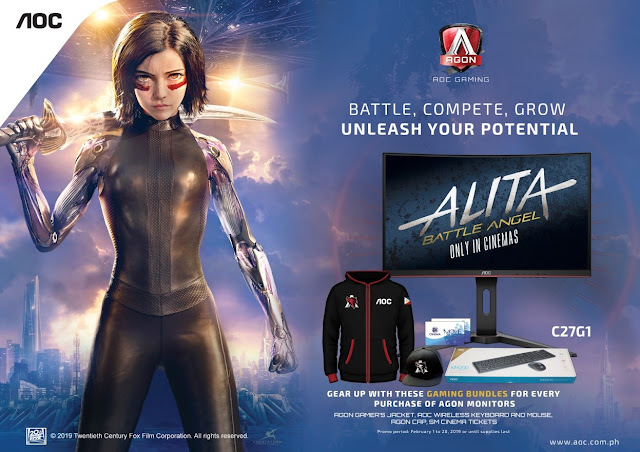 AOC has become the official monitor partner of Alita: Battle Angel, an epic adventure from the producers of Titanic and Avatar. The partnership will involve various cross-promotional activities including regional social media contests, and a simple web-based game. AOC and AOC Gaming have always been dedicated to the pursuit of the next level of visual and gaming experiences, respectively, enhanced by innovative technologies. By partnering with Twentieth Century Fox Film since 2013, AOC has engaged viewers in new cinematic adventures through supporting and promoting films like X-Men First Class and The Martian. 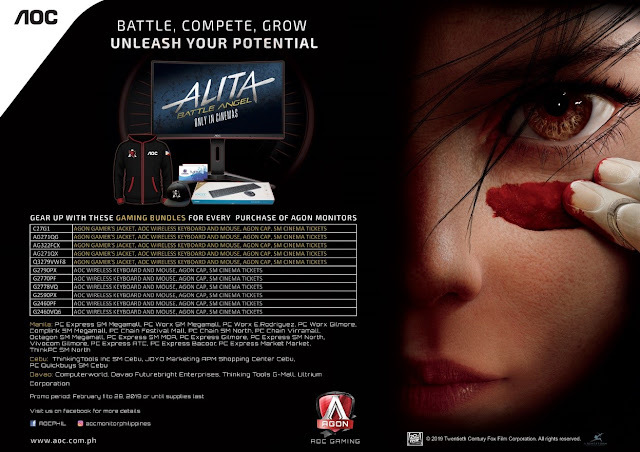 Combat scenes and the theme of realizing one’s own potential are prominent in Alita: Battle Angel, which aligns perfectly with AOC Gaming’s vision to help gamers always stay at the top of their game through competition and constant self-optimization. Thematically, the movie is a perfect fit for AOC Agon: AOC’s line of premium gaming monitors designed for the highest level of gaming competition. As a cyborg with elite battle abilities, both Alita and Agon displays represent how technological excellence can bring combat potential to new heights. AOC has recently launched a new gaming monitor in the Philippines: the G1 series, which will bring PC gaming in to a heightened competitive combat visual experience. • The AOC G1 series comes in three variants: the 32” inch C32G1, 27” inch C27G1 and the the 24” inch C24G1. • They are equipped with a curved 144hz, 1ms response, VA Panel that also supports AMD FreeSync. • It has anti-glare screen surface with a curve measured at 1500R, steeper than the 1800R typically found in other monitors. • The monitor also offers a decent coverage of sRGB color space (99%). • It also has slim screen bezels measured at 0.26in on the sides and 0.85in at the bottom giving the monitor that sleek and modern look. Gamers can now gear up with AOC’s gaming bundle promos where they can avail swags like the AGON Gamer’s jacket, AOC wireless keyboard and mouse combo, AGON cap, and SM Cinema Tickets. You can refer to the promo flyer below for more information.